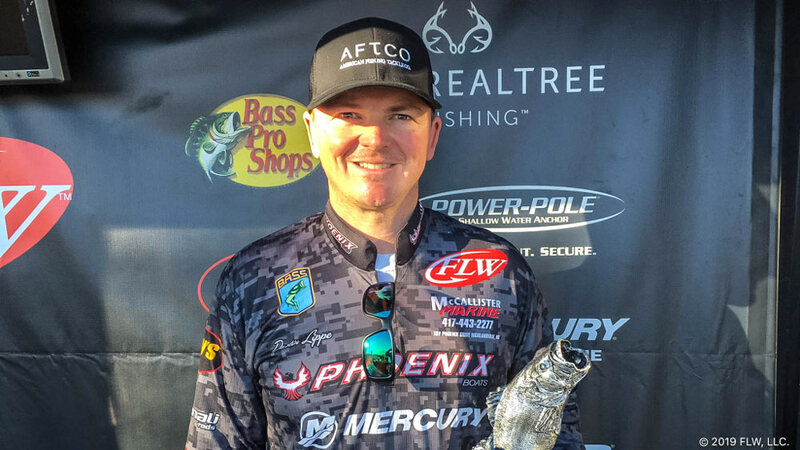 Dustin Lippe, of Lampe, won the T-H Marine FLW Bass Fishing League (BFL) Ozark Division tournament on Table Rock Lake on Saturday, March 16. Lippe weighed in five bass weighing 17 pounds, 15 ounces. Photo courtesy of FLW, LLC. Boater Dustin Lippe, of Lampe, caught five bass weighing 17 pounds, 15 ounces, Saturday to win the T-H Marine FLW Bass Fishing League (BFL) Ozark Division tournament on Table Rock Lake. Lippe earned $6,229 for his efforts and 250 points in the Ozark Division presented by Bassing Bob standings. Should he go on to win the division’s Angler of the Year title, he will earn another $3,000. Lippe said he spent his day fishing deep points, mid-lake, up the Long Creek, White River and the James River arms. Medina caught a bass weighing 6 pounds even – the heaviest of the event in the Boater Division – and earned the day’s Boater Big Bass award of $815. Mark Peterson of Bethalto, Illinois, won the Co-angler Division and $2,614 Saturday after catching five bass weighing 17 pounds, 4 ounces. The tournament was hosted by ExploreBranson.com. The top 45 boaters and co-anglers in the region based on point standings, along with the five winners in each qualifying event, will be entered in the Oct. 24-26 BFL Regional Championship on Grand Lake in Grove, Oklahoma, presented by Mercury. Boaters will compete for a top award of a Ranger Z518L with a 200-horsepower outboard and $20,000, while co-anglers will fish for a new Ranger Z518L with a 200-horsepower outboard.